Ok so the bidding for Luke's prototype Ibanez on eBay has ended -- 270451639615. After a 10 day listing with a starting bid of $18,000 maybe it was overreaching a little bit. But really, I was half expecting a collector and Toto fan from Japan or Europe to scoop this one up. Chalk it up to tough economic times. The Luke protoype was modelled closely after the Ibanez AR300, which was a set-neck, dual humbucker instrument with coil-tap options for each pickup. The prototype also had a slightly offset, asymmetrical body shape and the now de rigeur pointy headstock. Strangely, the Ibanez RS1010SL Steve Lukather model that was eventually released in 1983 adopted the familiar early RG Roadstar body shape and headstock, with a bolt-on neck. Ibanez spiffed up the RS1010 with an ebony fingerboard with mother-of-pearl 'snowflake' inlays, custom Lukather pickup in the bridge position and a bird's eye maple top. They also included a coil-tap on the push/pull tone pot for Strat-like tones. But I always thought that the one-off Lukather prototype was way cooler. Too bad that the only design features they kept on the production model were the humbuckers and snow-flake inlays. 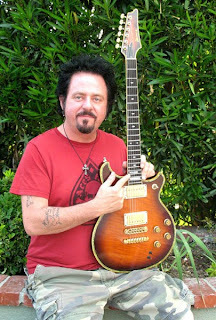 Lukather's relationship with Ibanez didn't last long -- production of the signature axe ceased by 1984 and Luke started playing his Mike McGuire-built Valley Arts instruments exclusively. He is currently endorsed by Musicman who produce his 'Luke' signature model.